Nobel thoughts Bill. But how will our armaments industry survive without a “war on the ATTITUDE of ‘terror”. That war is unwinnable and therefore perpetual so it suits their purpose. The military academies have become the “deep roots” of continuing militarism for a corporate controlled political system that uses military force solely for their benefit to acquire resources and markets. Meanwhile our underlying democracy has been bastardized into compliant boosters of the lie that we are trying to civilize the world. Corporate control of the press (what is left of it) the electronic media, and many learning institutions (charter schools, university endowments, etc) have left our citizens devoid of enough information and thinking ability to even vote intelligently. We are in deep trouble when our president decides that the hacking of a private corporations computer system is a “national security’ issue requiring national action. War again? Your questions are all worthy of discussion and the answers you suggest have some merit. I particularly applaud the idea of making the academies “finishing schools” and leveraging sound civilian education with a more strategic, or technically focused, military preparation. I do *not,* however, agree with the idea that Academies have militarized our foreign policy; rather, our strategic decision-makers and inadequate decision-making have, over the last few decades dragged us into strategically unwinnable conflicts. Our military leadership–in part but far from completely dominated by service academy graduates–have certainly urged and supported *preparation* for potential conflicts–but only those who have not served since 9/11 think those serving now want this to continue. As for refocusing the military on infrastructure and the biosphere: again, there is capacity to contribute (some of which we’re already doing: look at DOD focus on operational and alternative energy; it’s not vast but it’s serious and sustained); but there are obstacles–nearly all of which are external. If our Congress will keep commercial interests and labor unions from blocking military competition; if the science were definitive enough to warrant the work of hundreds of thousands of people on tangible endeavors that would prevent further warming, then the military could doubtless make some difference. There are a lot of worthwhile things our military could do that are restricted, prohibited, constrained, warped and otherwise impacted by laws passed over time for some good and some venal reasons. BUT–and this is a very significant caveat–it is too easy to forget that “the *most* serious threat” we face is still the variety of hostile human beings who possess the means to impose widespread loss of life. If global warming forces the phased relocation of tens of millions of coastal inhabitants, it is still “less serious” than the destruction of two or three mega-cities by nuclear weapons, or the destruction of entire nations by any number of other weapons of mass destruction. We can’t wish them away; we have to prepare, at some level, to both deter and actively combat them and the precursors that lead to their use; and while the US military can and should be a force for global good, some of that good is nothing less than the prevention of old-fashioned, ugly death visited by people who are less concerned about US infrastructure or global warming than they are about regime survival and accumulation of power. The key is in finding a balance, and more importantly, in having knowledgeable national leaders over time who will properly direct that balance, neither assuming the world is all hostile or all benign. Last time I checked, military professionals are willingly under civilian control and those civilians must know and lead well–or it’s a lot less important how our Academies do their jobs. The academies are arguably less connected to the people than they should be. And this is not solely the fault of the academies, though elitism and a tendency to resort to an enclave strategy when under fire do enter the picture. The larger question is how to do we strengthen connections between the military and the people? How do we make the academies less insular? More open to new ideas? And I’m not just talking about more tourists through the gates to watch parades and games. The academies were just as isolated from society when Bradley and Ike went through (ditto Grant and Lee for that matter),and the academies played a greater role in leadership of the services then than today. The rest of the military changed, not the academies, so suggesting changing the academy is the solution to this issue seems a non sequitur. Skydad.. Your ‘balanced ‘ approach is thoughtful but I question your assumption that threats to us requiring kinetic responses overlooks something. Our expansionist imperialism is the starter fluid for the external threats. Our military and intelligence services are the bully boys out there creating turmoil. Recent case; Ukraine and China. On a geo-political level our national policy is to have regime change in Russia and encircle both Russia and China. How do you think the Chinese look at our military “pivot” to the Pacific? Certainly not as a friendly gesture. China now has the second most powerful economy in the world and is set to best our economy within a year or two. China also now has a direct railway link to the EU. Are we going to change that? Back to Ukraine. Our neo-liberals, under the guise of democratizing Ukraine succeeded in funding and supporting the overthrow of one bad guy with a worse guy, and a pro fascist government. What have we gotten? Russia is up to the game and didn’t want to lose basing for their Black Sea fleet and decided to take the Crimea back. Remember it was always theirs. Now after several thousand deaths of Russians in eastern Ukraine who reasonably fear the illegal government we are talking warlike and trying to destroy the Russian economy . Now let’s look at the middle east and the sub continent. Did invading Iraq have anything to do with 9/11? Of course not. Did we not use the Arab Spring in Egypt to end up supporting the overthrow of the bad, but democratically elected Morsi government and decide that the old military dictatorship was their best solution rather than democracy? So our State department refused to name the military take over a “coup” and we and our good buddies, the freedom loving King of Saudi Arabia continued to fund the Egyptian military and now they are the new Mubarak. These are only some of the more recent and egregious actions which are making us a pariah nation, more feared than respected. Are the people in Saudi Arabia, Yemen, Palestine happy about our role in supporting their oppressors. taht’s where the external threats come from. Our military forces, executing these demonic policies, are not winning any Nobel prizes for peace but rather throwing fuel on the fire of turmoil. Now back to Iraq. ISIS, the new Caliphate state of Syria and Iraq. Who laid the groundwork for that? We need a recalibration as Col. Astore is suggesting. I don’t think we’ve moved beyond our Cold War ideology of us versus them (whoever “them” is today). Even recent, halting, steps to normalize relations with Cuba are drawing fire from Republicans who vow to reverse them. Why is this? Fear is the mind-killer. And fear sells. Until we can overcome our fears and try new approaches, we’re fated to wallow in militarism and division. Paradoxically, the U.S. military may profit in the short term (money and power), but in the long term our military will burn itself out in foreign fields fighting unwinnable wars. 1. Maybe, but we already do an abbreviated version of this with OTS. How would ROTC factor in to this calculus? 2. To answer this, you need to answer the question about what model you’d prefer. I think USAFA’s faculty is too military-dominated and too much so at the masters level which poses challenges for the education, but I don’t think we need to swing so strong as to go to bringing in Ivy League instructors (but see my later sports-related comment). More PhDs, greater incentives for independent research and publication (undervalued today at USAFA especially) would be the best first step. 3. I go back and forth on this one. Obviously hated it as busy work at the time, but have grown to see the value in it later. It tests and builds character, but whether it is the right type or the right lessons are relayed in AARs is a matter of training of the trainers as much as the curriculum itself, and I’m not sure that has always been effectively passed along (this gets to the comment about ‘we’ve always done it,’ a common refrain not just at the academies but in all bureaucracies – a good training of the trainers would pass down exactly WHY it has always been that way to impart the right lessons). 4. Definitely agree, and this is a challenge for a number of reasons. Location, roles, etc., all make this type of interaction hard on a regular basis, but various programs have been added over time to increase the interaction. This needs to be done more, but I don’t have the answers on billets or funding on how to make that happen. 5. Agree with all points here as well. Staying in Div 1 is a big part of our problem. Anyone in sports will recite MacArthur’s quote about the fields of friendly strife, but the fact is if you’re not competitive and a perpetual doormat, not much leadership lessons are learned; thus you must be competitive, and at FBS that means you need to recruit. I’d prefer to see all of the big 3 academies go down to FBS and join with the Ivy League (and add either William & Mary or Georgetown to bring it up to 12), which almost happened with the Ivy League was formed but was vetoed due to travel limitations and probably because DoD wanted the money and TV exposure for recruiting. Travel isn’t so big an impediment anymore, and with NCAAF league consolidation leading to power conferences and a playoff structure in the future, the utility of the academies hanging around there is just likely to decline. Move to FBS, focus on building up academic creds to compete more on that level, and regularly interact with that crowd of students on the field and in a cordial academic environment, and you will see a lot better change. 7. Here’s where you move a bit away from underlying empirics to a rhetorical point, conflating a variety of issues. If you want a villain in the military structure for the ‘perpetual war’ , look to the National Security Act of 1947, which guaranteed for the first time in our history a large, permanent standing military which broke the previous mechanisms for the balances of the war powers. Most people who I see debate the war powers today do so from either a point of ignorance or willful disregard for history. The founders set up a republic with a relatively small population in relatively limited geography with lots of natural defenses. This was a big part in enabling the model for the early republic that is for the most part codified in the Constitution – a permanent Navy (Navies were long held in esteem by British subjects such as our founders and not seen as a threat to liberty, and given the natural defenses I referenced – the ocean – a permanent standing Navy seemed to be essential), an limited standing Army which had to be approved by Congress on regular intervals, a state-centric regulated militia system that could be called up to form an Army when called upon (generally while the Navy was holding the potential invader at bay so to speak) who would be trained by that skeletal central mass, etc. History got in the way. We are no longer a small republic with limited populations and interests, we have far more vulnerabilities, the pace of technological change reduces the prospect of waiting to call up a citizen army, and the tools of war have evolved to where they require extreme specialization (this isn’t about ‘shock and awe – a perspective more favored outside the military than within – again see John Mearsheimer’s critique of it). Further, with only the example of monarchies and empires and no perspectives on how military professionalism might work in a republic (leading to Huntington’s observation that the founders may have written the war powers a generation early) the founders were writing to the prospect of a wholly different threat and worldview than the one we today face. Even so, we have long had challenges of ‘perpetual war’ and ‘undeclared wars’ that some such as Mr traven would deem illegal and which he seems to think were recent inventions. We were at war on our Western frontier virtually nonstop from the founding of the Republic through Wounded Knee. Our permanent navy was regularly called upon to engage in campaigns that were undeclared (to include this nation’s first ‘wars’ against the Barbary pirates). To your later point, the essence of nationalism is that there is always an ‘other,’ either who needs to be defended against or who needs to be ‘enlightened.’ Remember, plenty of our founders wanted to intervene in the French Revolution, with men like Jefferson and Paine believing it was a natural extension of our own and almost Trotskyist in their support of spreading democratic revolution. This is why we spread West, this is why we declared the Monroe Doctrine, this is why we sent out the Great White Fleet, this is why we intervene everywhere today. It is not a new trend, what was new about NeoConservatism was we were leading the way with bullets and not diplomats for the first time probably since Wounded Knee. Washington’s warning against militarism wasn’t so much about the dangers of intervention and alliances, but the realization that the US was small and fragile – picking sides between the superpowers of the day might mean the US would become a spoil of war if it picked the wrong side; alliances were for the future, not then. But moving beyond that, how does the military academy fit into the discussion. This brings us back to the central problem in your last essay. American policy is one thing, the US military is one step removed but is certainly an influencer, and the military academies are a further step removed but again an influencer of the military’s attitude. What is the influence that is the causal link? I’m still not seeing it. Excellent response. With respect to a causal link, I’d have to think further. Put briefly, I see the academies as both influencing American culture and reflecting it. And with the military being uniquely respected within wider American society (if one can believe the polls), the military has a special role as well as responsibility to uphold and reinforce America’s highest ideals. The academies have not done enough to push back against the disastrous wars and policies this nation has and is pursuing. It’s not enough to intone “duty, honor, country”; we must stand for what is right, instead of focusing on the might. In a me-first country, the academies play a special and unique role in providing a counterbalance to shortsighted selfishness and naked greed. Or, they should, just as the Churches and their ministers should. But in many ways the academies have become parochial institutions content to preserve their own privileges, much like the churches. And we see the rot in various scandals afflicting churches and the military: endemic sexual assaults, hastily and illegally suppressed, are perhaps the most notorious examples. America’s academies have much societal prestige. They can use that prestige to help effect a restoration, or they can remain mired in parochialism and contribute to the decline of American polity and policy. Perhaps I’m disappointed in the academies precisely because they are too much a reflection of undesirable aspects of American society. Michael.. b. traven wrote the classic story of greed “The Treasure of the Sierra Madre”. A Swede born in Chicago grew up in pre and post WW I Germany. I try to honor him. Did the native people who really owned this land go to war against us out of necessity or to protect their land? Was the ‘war” in Iraq because the Iraqi’s attacked us? You put up many good arguments but because we have a history of imperialistic wars does not make them legal nor something to rationalize later predatory actions.. I have been proud to live in this country but I have not been proud of how we stole other weaker people’s land. I am especially not proud, indeed I am ashamed, of our imperialist and illegal aggression against other countries in the last 40 years because our Presidents like to look tough and it pays with money from those who benefit from resources stolen and markets opened and war goods sold. .
At 90 I have a much longer view of our history than most. I don’t “deem” these wars illegal. They are illegal ! History will show that to be true and unfortunately we will have to pay the price for the nationalistic hubris that led us into them. You seem to miss the point- we engaged in expansionist wars against Native Americans for the sake of conquest. The point was we were arguably more imperialist then. We were arguably more imperialist when we supported uprising in Texas and California to grab lands from Mexico (the thorny issue of slavery caused us to delay annexation of Texas, but still the ultimate goal), or what about our annexations of Hawaii and claiming of territories like Puerto Rico following the Spanish-American war? The point is this claim of abandoning democracy for imperialism is not a new one, it is as old as the Republic itself. Are we imperialists today, and more importantly is the military and ultimately the service academies driving that imperialism? Absolutely not. Did our country make some mistakes that resulted in over-expansion in the Bush years? Yes, but it was still not imperialism even then. With power not just comes responsibilities, but interests. We have too broadly defined them in the past which has led to poor decision making, but to throw around the canard of ‘imperialism’ is one step removed from throwing around the canard of nazism without foundation. It just weakens the argument. Michael.. Thank for responding to my comments. Discourse sharpens the mind. First , let me make one point very clear. I do not think that the military academies are “driving” our ill-advised foreign aggression. They are just deep rooted enablers to self serving politicians who are in thrall to their paymasters, “big business, corporations, or whatever. My brief, intense contact forty years ago with war experienced Academy graduates who had resigned their commissions in protest against the Vietnam war impressed me deeply with the honesty and commitment of these young men and the training they had received. They understood their obligation to our Constitution and the rule of law. They understood Nuremberg. They were not ideologues. They hadn’t swallowed the “American Exceptionalism” Kool aid. You say “ With power not just comes responsibilities, but interests.” With that word “interests” you have opened the door to the fundamental concept of ‘imperialism’. An imperialist’s “interests” have absolutely nothing to do with the ‘interests’ of their victim. It is also important to accept the fact that today ‘imperialism’ does not necessarily mean land ‘occupation’ and foreign rule. The imperialists have figured out that it is much cheaper to merely effect “regime change” and put in your own local puppet who will do your bidding. We just did that in Egypt and Ukraine. History shows us that we will live to regret both. Our big mistake* in Iraq was to put in a Shia Moslem president who was not only corrupt but more indebted to Iran than to the US. We did the same thing earlier in the 50’s with the overthrow of Mossadegh in Iran and the blowback has been terrific. Now it is coming back in spades with the appearance of ISIS in Syria and Iraq who is not just interested in destructive opposition but is setting up a civil structure in the vast area they now control. It appears that you don’t want to call a spade, a spade or a fascist a fascist . I lived in this country when fascist groups who mimicked the German Nazis were active in virtually all of the big urban centers in this country. The German-American Bund Brown Shirts and William Dudley Pelleys Silver Shirts and Father Coughlan on the radio every Sunday. We are closer today to that period with the abandonment of habeas corpus, the so called “Patriot” Act, the spying on all of our citizens by the NSA, and the militarization of police forces, etc. No. All states have interests. Empires have interests. Monarchies have interests. Republics have interests. You then go on to fundamentally redefine ‘imperialism’ and assert that any revolution that goes on in the world that happens to put in power someone whose interests align with our own must therefore be part of some conspiracy of puppets running some kind of ‘virtual empire’ which ‘history shows we will regret.’ When Morsi first took power in Egypt, the US by our other ‘imperialist puppets’ like Israel and Saudi Arabia of selling out a long-time ally to capitalize on the Arab Spring, and then when Sisi overthrew Morsi we were accused of backing that to overturn ‘democracy’ (nevermind how badly the Muslim Brotherhood overplayed their hand and misread their ‘mandate’). You see some imperialist plot, I see a lot of nonsense. So why does history show we will regret it? Is it because inevitably they all will become the Shah? History says no such thing. And even so, the 1979 wasn’t blowback for Mossadegh no matter how much some on the extreme fringe of the left want to make it out to be that – had the Shah run a better regime or had the US been paying any attention and actually monitored him as the ‘puppet’ he allegedly was, it is unlikely the revolution would have taken place – his actions after taking power stoked the flames of revolution, not the way he came to power. Is it because we cannot control them in practice? Then they are nothing close to our imperialist puppets. I am more than happy to call a spade a spade, but I do not cry wolf. To make every opponent out to be Hitler or an imperialist conspiracy not just makes serious people just shake their head at your argument, it does a disservice to those who have been the actual victims of such oppression, because if everyone is Hitler than Hitler couldn’t have been that historically bad. We are not an empire or imperialists, we are the world’s sole superpower acting in ways to protect the interests we fought for in the World Wars and on which the international system that you keep referencing was built, be they the core of the Fourteen Points and the Four Freedoms, or their evolution into the UN charter and post-war policies of collective defense and the economic order that came with these developments. (And no, our biggest mistake after invading was de-Baathification of the bureaucracy and the military; a Shi’a leader would have taken the helm regardess, unless you favored replacing a Sunni strongman with another which hardly fits in with your previous perspectives on self-determination). The academies have historically produced “true believers” dedicated to their service, and fiercely loyal to the academies they attended. Is this dedication being degraded by a bureaucracy that misuses the talents of its young officers? “Why Our Best Officers are Leaving”. Come on Bill. You can’t be serious. I’m not trying to ‘out contrary’ you but this article, written in 2011 is sheer nonsense. David Petraeus one of the best? A philanderer, an unabashed self promoter who was screwing his army biographer and his high point was the Iraq “surge” which time has shown was not just a sham but a wretched failure. His performance in Afghanistan a stunning success? Is that why we will be there for an indefinite future? And for the author to compare those other “best officers” to Steve Jobs or Wozniak must be taken as a cynical joke. Moving into the well paying leadership in a huge corporation has nothing to do with”innovation” or “creativity”. It has to do with money, the money they are paid and how much money they can squeeze out of their employees and consumers. That’s what corporate capitalism is. Large corporations do not innovate; they use capital to buy small innovators. And then the usual pattern is to push out the real entrepreneur and milk the carcass for profit until it fades away into the mediocrity of the corporation. These guys let the government pay for their education in an elite military school and they then use that to quit early and leverage the halo of their position into a cushy, well paying corporate job. Then as a closer to this successful career, after sucking on the teat of the government at a military academy they become part of the corporate elite who decry government interference in their business which is usually for the common good. And as a closer I would like to know why the author of this ridiculous article did not comment on a much more realistic assessment of why so many bright and dedicated top officers were unceremoniously encouraged to leave the military. That happened during the Bush disaster where he decided to secure the evangelical Christian vote by “Christianizing” the military. As a result senior sectarian officers were sidelined and Christian zealots were pushed ahead. The picture in the previous post in this blog of a monumental Christian church as an outstanding landmark at the premier Air Force Academy is a stain on the separation of church and state in our republic. Easy, traven! I didn’t post the article because I agree with everything in it. I do think the military’s personnel system is seriously flawed, and the system of promotion too rigid, with a ticket-punching mentality. And I do think the Army is losing good officers who are frustrated with the system, who are demotivated by the bureaucracy, and who don’t want to wait for twenty or thirty years before they reach a rank in which they might be able to change the system. But I also think this says something about the weakness of the military academies. Unlike ROTC or OTS/OCS, the academies are supposed to produce officers who truly want to make the military their career. Aspirants for flag rank, if you will. A corps of hyper-motivated cadets who become topnotch officers because they draw their very being from the military. Such a vision, valid or not, desirable or not, has been used to justify the high cost of the academies vis-a-vis relying on ROTC or OTS/OCS as commissioning sources. 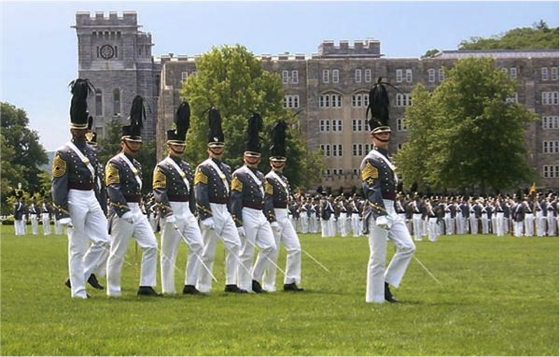 But if the “regular” officers produced by West Point are punching out at the same rate and as quickly as their “reserve” counterparts from ROTC and OCS, if they’re equally as disenchanted with the military, then either the academies aren’t producing the level of commitment to the military that they aim to achieve, or active duty service is so bad as to drive out much of the “best and brightest,” leaving too many mediocre time-servers behind. Such a dynamic is a matter of concern for any organization, which is why I posted this article. Bill.. Did you intend to leave out discussing the Bush push to “Christianize” the military for a reason? The Air Force Academy has been a center of this activity, but it continues under Obama to be a problem throughout the military that makes it uncomfortable for free thinkers and others to serve . The narrow mindedness that comes with this attitude also creates the racism that has dogged our campaigns in the Moslem “brown” lands. A very complicated question. I did not see a “Bush push” in this area, but I witnessed the power of Christian evangelism in Colorado Springs, which definitely influenced the AF Academy. As you know, Mikey Weinstein and his Military Religious Freedom Foundation is all over this, and I’m not sure I have much to add. Certainly, God and country is an idea advanced at all the Academies, especially at the AF Academy due to all of the evangelical churches and organizations that reside on the north end of town, near the Academy. Some of this is relatively harmless. The military naturally tends to attract young conservatives from the Bible belt, for example, not agnostics and liberals from Vermont communes. And they go to church. And they have a lot of zeal. That said, there are well-known cases at the AF Academy where evangelicals went much too far. They used command and supervisory influence to spread their Christian views. They were called to account, and the Academy took steps to prevent such abuses in the future. Whether those steps were adequate, or whether they were truly sincere and will be strictly enforced, remains to be seen. We are getting a bit off topic here but curious minds want to know. Exactly how do the military academies get away with advancing the idea of “god and country ” on taxpayer money? Even our school system can’t get away with that one. One fundamental law of this country, built on our experience with the Church of England’s monarchs is that democracy does not flourish in a theocracy. In three years between 1943 and 1946 in the U.S. Army Air Corps I never heard anything about “god” except in the popular song of the time “Coming in on a Wing and a Prayer”. I saw several planes land in flames. Were they not prayng? Well put, traven. Another complicated issue. Look at our history. America was founded by religious dissenters and enthusiasts. Puritans. Quakers. Methodists, and so on. Catholics came to Maryland. Jewish immigrants. Muslims more recently. America, if you believe the polls, remains a land of believers in god. One thing I will say. When I visited the AF Academy chapel, the beautiful upstairs was used for Protestant services, Catholics were stuck in a lower level, with the Jews and Buddhists (separate chapels). There is also an “all other faiths” room for Muslims and “others.” At the time, I was told this apportionment of space in the chapel was a matter of numbers. Lots of Protestants — they get the main chapel. Not many Muslims and Jews — to the lower level! You too, Catholics! To me, as a Catholic, it definitely sent a message about which religion had the lion’s share of followers at the Academy, and thus the lion’s share of the Chapel. And perhaps the lion’s share of power? Conclude what you wish from this. As a taxpaying citizen I am incensed by my money used to build any shrine to any religion in what is considered the “commons”. The military academies are in the ‘commons. That monstrous multi million dollar shrine to religion at a military installation is an insult to a basic premise of our republic. I also do not believe that “religious belief” should be “part of academy life”. In our country religious belief can be part each citizens PERSONAL LIFE, The Constitution guarantees that. Religion has no other place in any part of our civic or military life. Once we cross that threshold we are in dangerous territory to our democracy. The proof of this is apparent today in our splintered society’s politics where Christianity is used as an excuse for destructive foreign and domestic policies by religious zealots in our congress. Chaplains have served with military units since the U.S. Civil War, if not earlier. Military bases have churches and chapels on them. Military units participate (voluntarily) in non-denominational prayer days; I’ve attended prayer breakfasts myself. I see nothing inherently wrong with this. It is American culture, and if you don’t like it, you need to change America. I agree that organized religion should not pervade or invade the political and military realms. But on a personal level, and for many people, religious belief informs all aspects of their lives. People can’t separate their religious belief from their beliefs on politics, on society, and so on. The problem comes when such people seek to proselytize — when they seek power over others. This is especially troublesome when a person already has power in the form of supervisory authority. If you want a secular military, you need to restore the draft; then draft only atheists, agnostics, and other non-adherents to organized religion. But if you want to keep an all-volunteer military that recruits largely from rural or small-town areas that espouse conservatism in Bible-belt settings, you have to accept a military that’s influenced strongly by Christianity. I don’t see a way around this. Nor do I see it as a major flaw, except in cases where religious belief intervenes where it shouldn’t. If you want a military that reflects the broadminded deistic views of the Founders, let’s draft all graduates of Berkeley, Harvard, and similar liberal universities into the military. I don’t think so. The problem is a mediocre CIVILIAN LEADERSHIP performance running a military that it is not suited to run, by temperment and worldview. Korea and Vietnam were defeats of policy and mindset not attributable to the military’s domain of expertise.